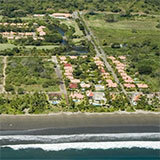 Ocean View Condo for sale located in Colinas Paraiso, Playa Hermosa. Take the elevator or stairs and get to this nicely finished condo that features 2 beds 2.5 baths with 1250sq ft / 115m2 of living space plus outside terrace. This condo tower consisting of only 6 units offers covered parking and community pool. The condo comes fully furnished with stainless steel appliances, 40"Plasma TV, W/D, and Central A/C.